A Calla Lily centerpiece is beautiful but can be expensive, especially if you need them out of season. 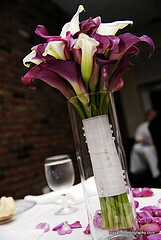 However there are ways to still create stunning centerpieces with Calla Lillies without it costing a fortune. A classic centerpiece with Calla Lillies is to use a very tall vase and then have the Calla Lillies looking tall and glamorous. Normally you would have a number of flowers in each vase which would be expensive, instead think about using narrower vases, still high but only able to hold one or two stems. This way you are spending less on the flowers. You can pick up tall vases at thrift stores and also rent them if you don't want to use them again. A very popular wedding centerpiece is to have one Calla Lily submerged into a goldfish bowl vase, you wrap the steam around the glass and the result is a very contemporary centerpiece. 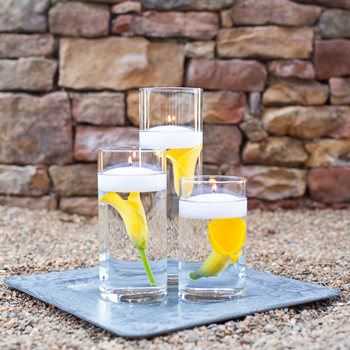 Have a look at this how to video which shows two very dramatic Calla Lily centerpieces, one is where one Calla Lily is submerged into a cylinder vase with pebbles at the bottom of the vase and a floating candle on the top, it is very striking and would not cost that much to reproduce. 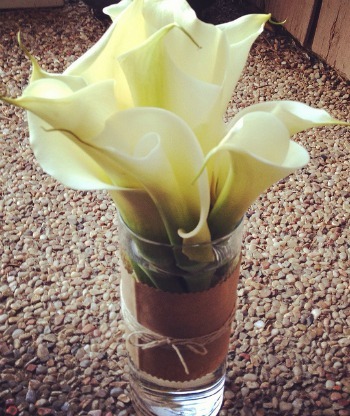 As Calla Lillies are so beautiful they don't really need that much else to make a centerpiece look stunning. 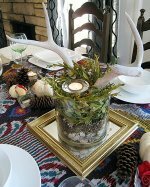 This centerpiece vase is made from a glass jar with brown paper tied to it, you could make it prettier if you used lace or ribbon around the jar but the overall effect is still a pretty centerpiece. If you are looking to design your wedding centerpieces and you have Calla Lillies in your wedding bouquet then these can be the centerpiece for your top table. 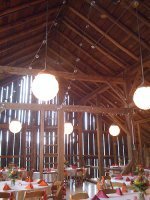 All you will need is an empty vase waiting for you at the table ready for you to place your bouquet in, one less table to decorate is always a saving! And you could also use your bridesmaids' bouquets to decorate the tables too. If you are worried about ordering too many flowers or not enough, then take a look at these wedding flower packages from fifty flowers. Love the fact that they take all the guess work out of what you need and the prices are really great too. 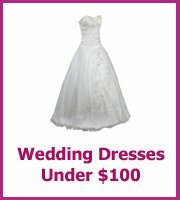 DIY Wedding Flower Packages - All the Flowers you need packed in combination boxes - Choose your Colors! Another way to save money is to use silk Calla Lillies for your centerpiece, most silk flowers look amazing as the designers spend a fortune trying to perfect their silk flowers to look just like the real thing. Rather than water in your vases you could use: coffee beans which work really well with the burnt orange flowers, glass beads and even marbles. The beauty of silk flowers is that you can make them up ages in advance, they last for ages as long as you remember to dust them and if you wanted you could resell your silk flowers after your event. 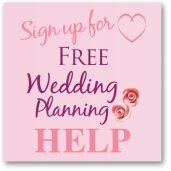 There are lots of brides that are looking to save money on their wedding plans and would be happy to buy the flowers from you.